According to the Office of National Statistics (ONS) construction performance weakened towards the end of 2017, as output in the period September to November 2017 decreased 2.1% compared to the period June to August 2017. Previous decreases in new orders, particularly in the commercial and public non-housing segments, now appear to be filtering through into lower volumes of work. In 2018 the residential construction sector is expected to grow, as the government announced an additional housing stimulus package worth GBP 15.3 billion over the next five years, bringing total support for housing to at least GBP 44 billion over this period. Public spending on infrastructure is expected to expand, and some big projects such as Crossrail 2, Thameslink, HS2 and Hinkley Point should ensure improved performance in 2018. 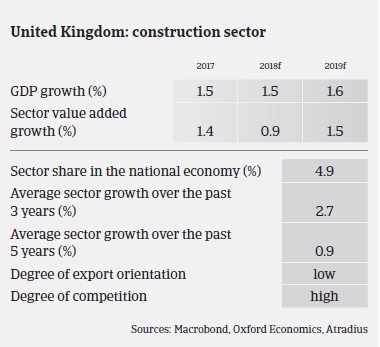 That said, the outlook for commercial construction remains more muted, as uncertainty over the outcome of Brexit negotiations has a dampening effect on British businesses investments. Legacy contracts have been a serious issue for the construction industry over the past 3-4 years, as many businesses pursued an aggressive accounting strategy by sealed risky contracts which proved unprofitable. Problems have been exacerbated by rising raw materials and labour costs. In 2017 four out of the top 10 construction companies in the UK issued profit warnings, and in January 2018 Carillion, the 2nd largest construction company in the UK and one of the government’s biggest contractors, filed for voluntary liquidation, struggling under GBP 1.5 billion of debt including a pension shortfall of GBP 587 million. The subsequent knock-on effect is expected to be huge, as it is anticipated that between 25,000 and 30,000 suppliers and subcontractors are owed around GBP 2 billion. This will surely cause substantial financial distress for thousands of suppliers along the value chain. Average payment in the British construction industry is 75 days, and the level of protracted payments and payment delays remains high. After increasing in 2017, the level of non-payment notifications is expected to increase further in H1 of 2018, additionally fuelled by the Carillion liquidation. For many smaller construction businesses problems further up the supply chain regarding delays in payments will only intensify the issues they already have and drain them of their “lifeblood” of cash, which could have serious repercussions on their performance. 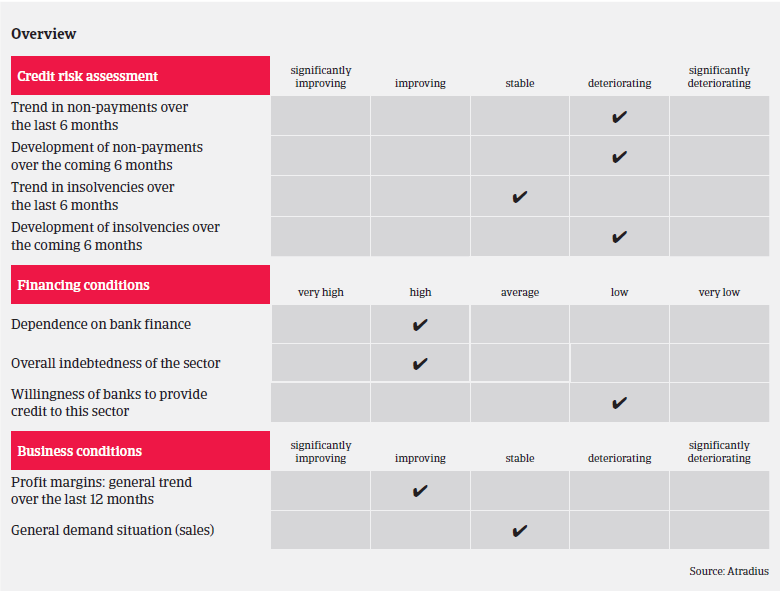 With the problems experienced by tier one contractors in 2017 and the Carillion liquidation, access to bank finance remains difficult, especially for smaller construction businesses and companies in sectors such as support services, particularly those with feeble balance sheets. Due to all this and a general concern over the overall state of the UK economy the level of insolvencies in the construction sector will remain high and is expected to increase further in 2018, by about 4%-5% year-on-year. 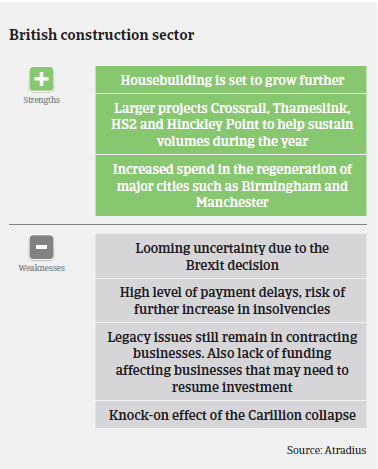 Beside the current market shake-up caused by the Carillion liquidation the Brexit issue will undoubtedly have an impact on the construction market, as the industry is very susceptible to shifts in investor confidence. If the coming months fail to deliver greater clarity about the conditions under which the UK will leave the EU, the commercial and infrastructure segments in particular could struggle. As more than 60% of building materials are imported from the EU, any increase in tariffs or limits on quantities imported after leaving the EU could lead to higher costs for British construction businesses and a shortage of building materials. Once the UK leaves the Single Market it is likely that the current issue of skill shortage will worsen, especially if there are no follow-up agreements with the EU on the free movement of people. This could result in even higher pressure on wages, causing construction firms to face considerably higher project costs. Additionally it could reduce the capacity of the industry to deliver new houses to meet the government’s housing targets, and therefore further deepen the current housing shortage, especially in London. Currently the UK construction sector still benefits from having access to the European Investment Bank (EIB) and the European Investment Fund (EIF), which have invested EUR 7.8 billion in major infrastructure projects in the UK and provided loans worth more than EUR 500 million to smaller British construction businesses. A loss of that financial support could significantly impact the ability of businesses to deliver big infrastructure projects such as High Speed 2 and reduce development opportunities for start-ups. We continue to underwrite cautiously, with risks considered on a case-by-case basis, while the failure of Carillion has increased vigilance. Even more than in the past the need for up to date regular financial information supported by visits, meetings and conference calls is essential to be able to provide the most informed underwriting decision. The speed at which seemingly good performing construction businesses can deteriorate requires extra scrutiny on order books, margins and contract details.